The Mittel German Spitz is a lively, alert, bouncy, independent, devoted and watchful dog. He's a happy dog who seems to smile and laugh at you, and he is extremely devoted to his family. While he can wait patiently alone for a few hours, what he craves is human company: he is not a dog who can be left ignored in a yard. He needs mental stimulation and to be involved in your life and your activities, and if given a choice he would never leave your side. He's a companion who likes to cuddle with you but also a hardy, all-weather dog who is ready and happy to go for long walks and hikes. He needs moderate exercise to burn off his high energy and liveliness, and loves vigorous games or chances to run free in a safe area. He's bold and adventurous and active, and will demand your attention by jumping up and down or walking on his hind legs. He learns commands quickly and easily and is eager to please you, but he can also be a strong-willed and stubborn dog who may try to have his own way. He can be difficult to control at times, and may not always come when you call him. He will learn to be obedient, but you must be patient with him and use lots of treats and rewards, and avoid harsh methods and too much repetition. He is a friendly, smiling dog with his family and to those he knows, but he is suspicious toward strangers. He makes a good watchdog and will find a high perch so that he can monitor his surroundings. He will alert you with loud barks to the slightest sound and warn you of the approach of a stranger. He can be noisy, annoying, and bark far too much, and must be trained to quiet down on command. He can be barky with other animals and dogs, but will also get along well with them if he is properly introduced and raised with them. Since he loves to play and romp he can be good with children, but he is better with older children as he may be too fragile, nervous or snappish for young ones. He is an extremely high shedder, and so might not be a good pet if you dislike vacuuming frequently. 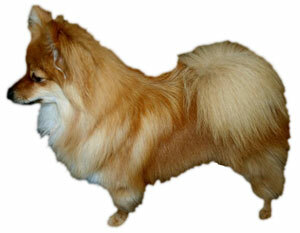 The Mittel German Spitz is 12 to 16 inches tall (to shoulders) and weighs 15 to 25 pounds. He has a double coat consisting of a straight, medium-length outer coat and a soft, woolly undercoat. His coat color can be black, white, brown, sable, black and tan, brown and tan, cream or orange. He only needs an occasional brushing but because he sheds enormous amounts of hair some owners brush him daily to minimize the hair loss inside the home. The Mittel German Spitz is descended from very old Spitz dogs who can be dated back to the Stone Age, and is related to both Keeshonds and Pomeranians. He is recorded in German literature from the 15th century, and for centuries was used in Germany as a farm and guard dog. By the 19th century the smaller, miniaturized version of his breed had become very popular throughout Europe, and it wasn't until the 1970's that his "mittel" or medium-sized stature was reintroduced. He is now primarily a companion dog, and was admitted to the Kennel Club (England) in 1985.